So, you want your child to do better in school? Or you dream of raising the next Einstein? Then take a close look at their diet. There are certain “brain foods” that may help boost a child’s brain development— plus improve brain functioning, cognitive skills, memory, and concentration. The food they eat becomes them – so be sure to feed your baby well. 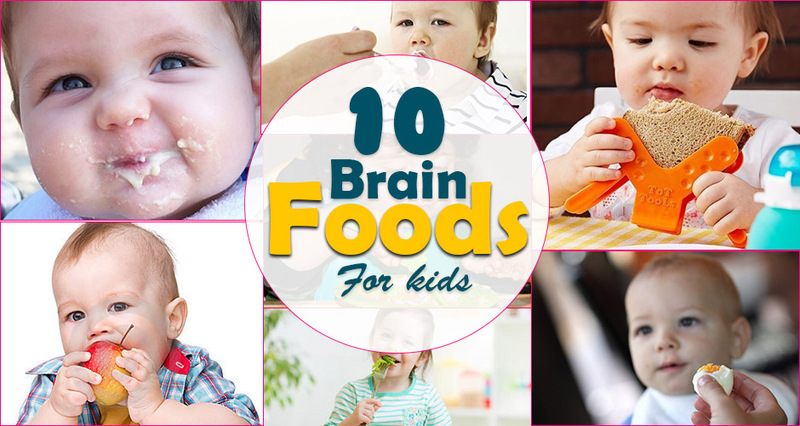 Here’s a list of 10 foods which will help your child to fully develop his brain power. B vitamins are necessary for the growth of brain tissue, neurotransmitters, and enzymes, and dairy products are a good source of these nutrients. Low-fat milk or yogurt are also great sources of protein and carbohydrates for the brain. 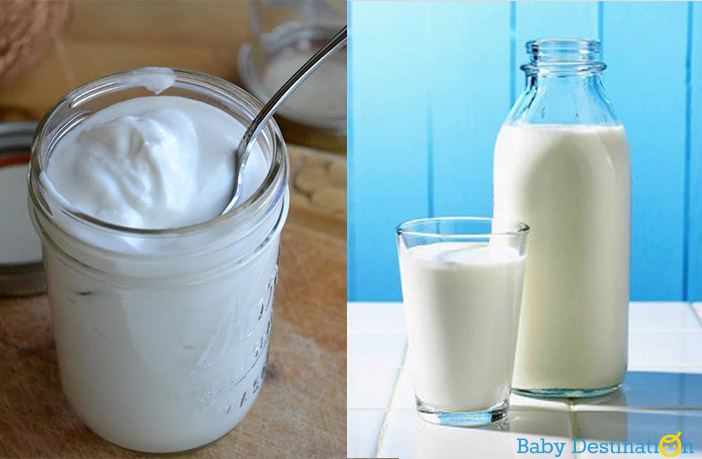 Full-fat dairy is also an excellent source of vitamin D, which growing kids need in greater amounts than adults. Try this: If your child does not like to drink milk, then try making frozen yogurt and fool him into thinking it’s ice cream. Take any sweet seasonal fruit like mango or banana and blend it with yogurt. Freeze in small cups. You can also pipe them and make yogurt drops. Kids often crave sweets, especially when they’re feeling sluggish. The sugar rush from sweets is not good for your child’s growing brain. 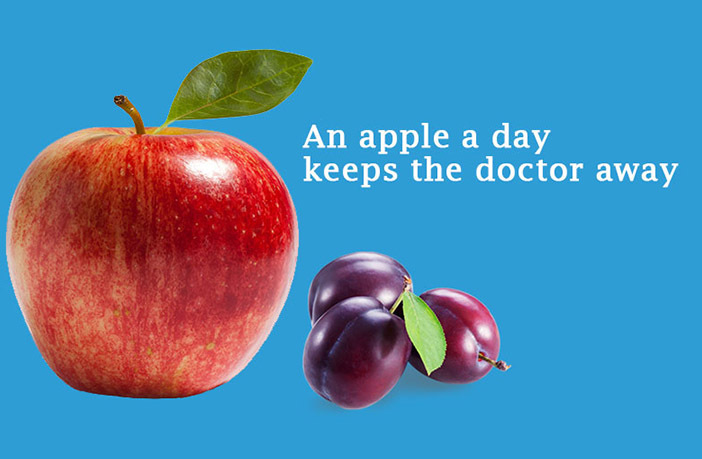 Try giving him apples and plums which are lunchbox-friendly and contain quercetin, an antioxidant that may fight the decline in mental skills. Try this: Add a couple of apple slices to his tiffin box. Sneak in a ripe plum as well to satisfy his sweet tooth. Bean, beans, good for the heart so the saying goes. Beans are also good for kid’s brains since they have energy from protein, complex carbohydrates, fiber, and vitamins and minerals. They can keep energy levels high. 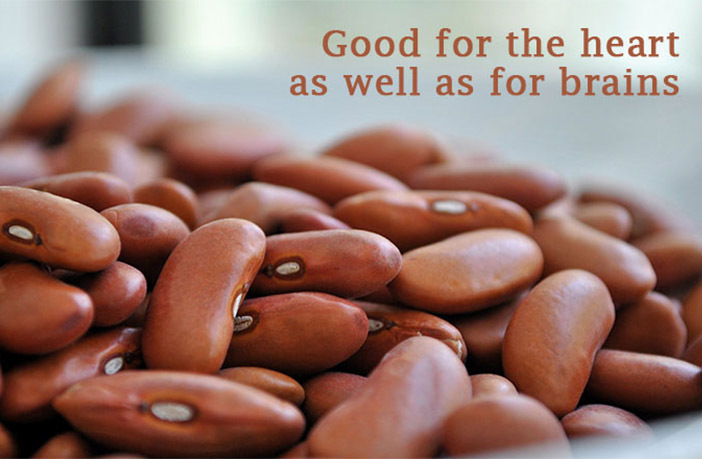 Kidney and pinto beans are good choices as they contain more omega-3 fatty acids than other bean varieties, which are important for brain growth and function. Try this: Add beans as a salad topper, as filler for lettuce wraps, or even add them to spaghetti for a more nutritious meal. From walnuts and almonds to flax seeds and chia seeds- make sure you add these to your kid’s diet. These are full of protein and essential fatty acids that boost mood and keep your kid’s nervous system healthy and functioning better. They also contain vitamin E, an antioxidant that protects nerve membranes, thiamin, which is good for the brain, and glucose which gives energy. 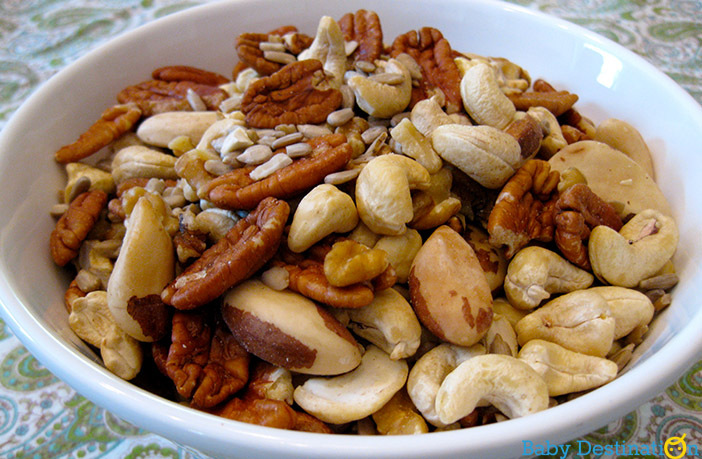 Try this: Make a trail mix of nuts and seeds and watch your child enjoy them. You can also make homemade granola bars with lots of nuts and seeds. 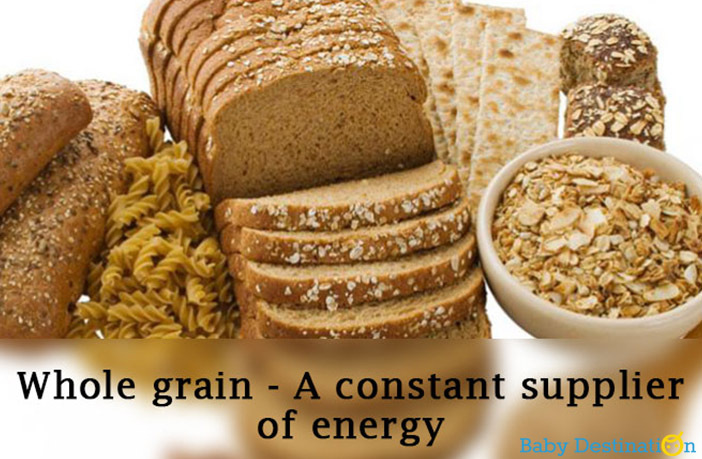 Whole grains such as bread and cereals provide glucose, an energy source the brain needs. The brain needs a constant supply of glucose — and whole grains provide that in spades. The fiber helps regulate the release of glucose into the body. Whole grains also have B-Vitamins, which nourish a healthy nervous system. Try This: Use as many whole grains that you can find to make a homemade cerelac powder. Use this powder as flour for rotis. 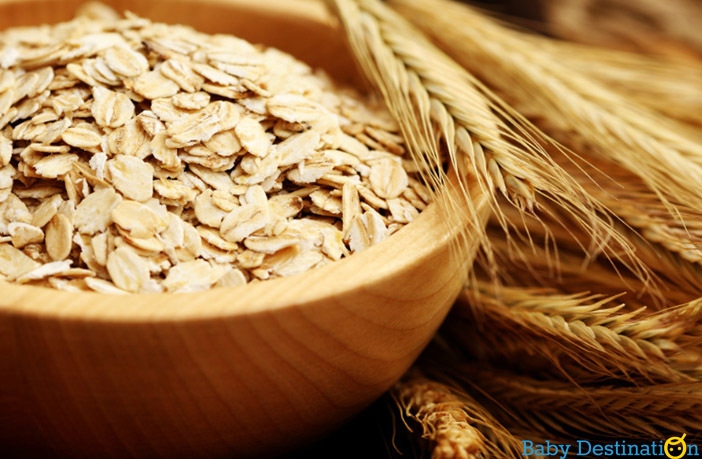 Oats are one of the most familiar hot cereals for kids and a very nutritious grain for the brain. Oats provide energy or fuel for the brain that kids need first thing in the morning. Loaded with fiber, oats keep a child’s brain fed all morning at school. Oats also are good sources of vitamin E, B-vitamins, potassium, and zinc — which make our bodies and brains function at full capacity. Try this: Use Oatmeal and honey to make delicious cookies or cupcakes, which can make a quick breakfast with milk. Eggs are known as a great protein source — but the egg yolks are also packed with choline, which helps in memory development. 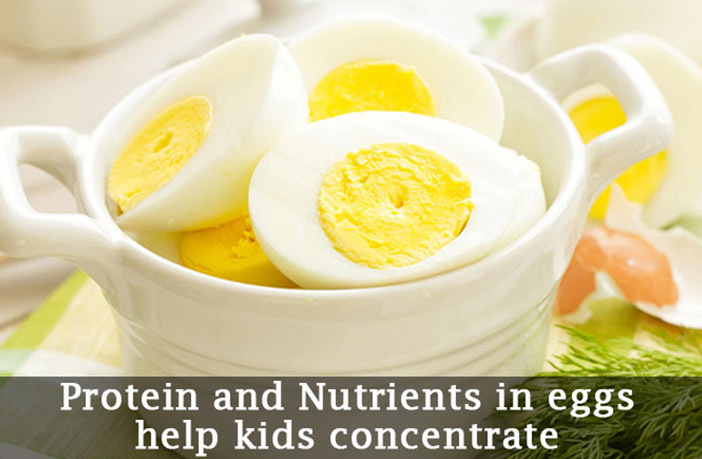 The protein and nutrients in eggs help kids concentrate. One of the best facts is that eggs are extremely versatile.Add them to sandwiches, wraps, and salads, and you’re done! 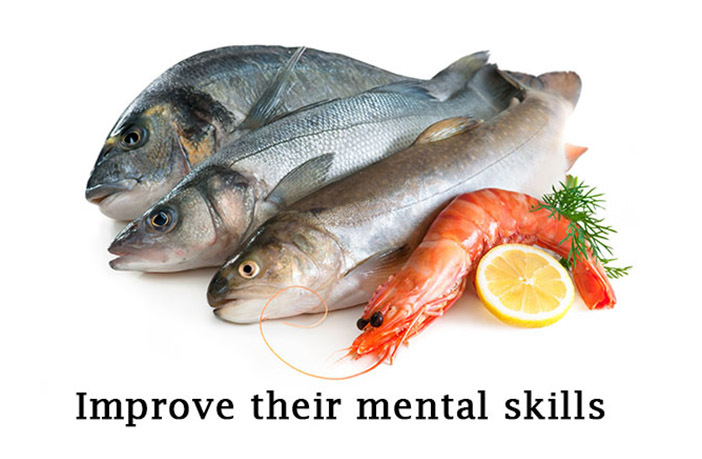 Fish is a good source of omega-3 fatty acids that are needed for brain growth and function. It also protects the brain from declining mental skills and memory loss. Getting enough of these fatty acids can help kids improve their mental skills. The more omega-3s they can get to the brain, the better it will function and the better kids will be able to focus. Try this: Pressure cook fish, carrots, and leeks with choice of spices for two whistles. Once cool, blend it and feed it to your baby. 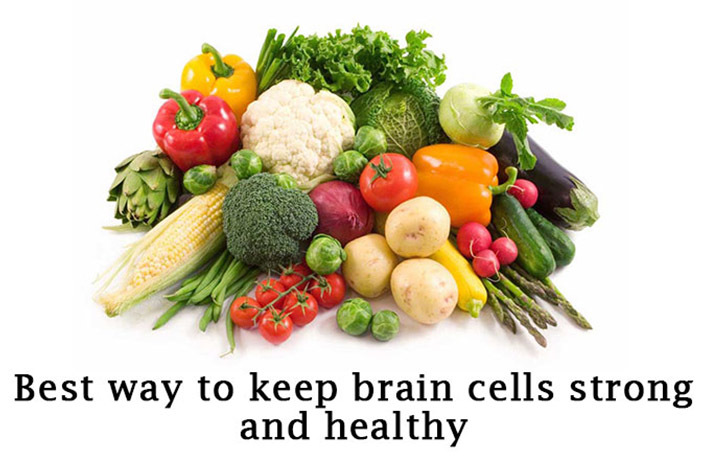 Tomatoes, sweet potatoes, pumpkin, carrots, spinach — vegetables with rich, deep color are the best sources of antioxidants that keep brain cells strong and healthy. Full of folate and vitamins, spinach and kale are linked to lower odds of getting dementia later in life. Kale is a superfood, packed with antioxidants and other things that help new brain cells grow. Try this: Roughly chop up any three seasonal veggies and pressure cook them in a cup of water for two whistles. Once cool, add some oregano and cilantro and blend to make a delicious soup for your baby. 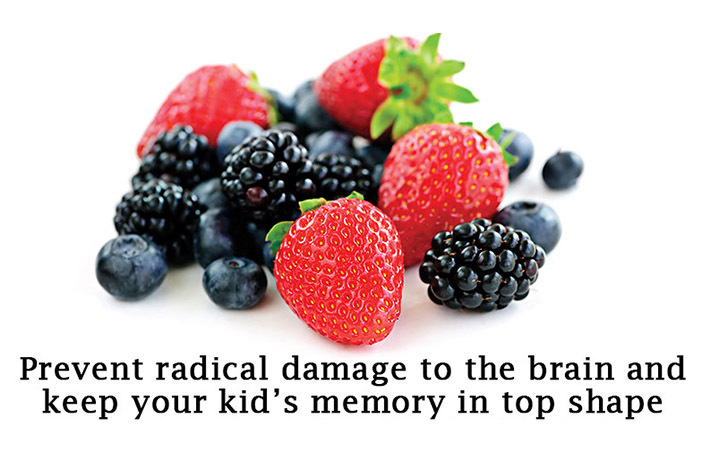 Berries are literally packed with valuable antioxidants that help prevent free radical damage to the brain and keep your kid’s memory in top shape. Plus, they also provide the body a good dose of Vitamin C, which improves immune function. Look for strawberries, cherries, blueberries, and blackberries – the more intense the color of the berry, the more nutrition it has. Try this: Take one cup of yogurt and one berry of choice and blend until smooth. Your baby will love this “dessert” so be sure to make enough!